Years ago, when I was a young cub reporter at the Jerusalem Post, one of my esteemed veteran colleagues complained to the police about a motorcycle gang that used his apartment house parking lot for noisy nightly daredevil stunts. The constabulary wasn’t much bothered but my colleague warned the teenage bikers that the cops know about their exploits. That put no damper on the hijinks. Quite the contrary, they increased in frequency, duration and decibels. When my colleague righteously admonished the loud louts, they threatened to kill him. That story stuck fast in my mind as a generic illustration for the attitude of the forces of law and order to the safety of assorted supplicants, not only on the local level. What was true in the Tel Aviv suburb back in the day, is just as true globally nowadays. Anyone seeking action and justice is sure to be judged as a pesky irritant who disturbs the peace of the presumed guardians of fair-play. Anyone who squawks about any sort of aggression upsets stability. Nobody knows this better than Jews because, alas, the Jewish people have had so much cause to squawk. It therefore became the goal of policy-makers in the leading democracies to downplay German genocidal predations and adhere tenaciously to a strategy of noninterference in the “internal affairs” of the Third Reich. 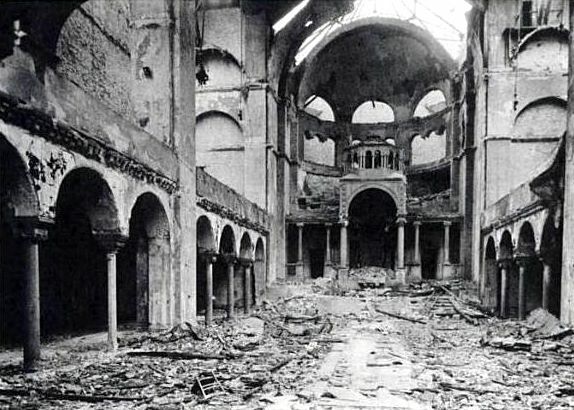 Even when the Nazi death machine was already switched into its highest gear, and when WWII raged in its fullest fury, the Allied powers somehow refused to acknowledge the premeditated and methodical extermination of Europe’s Jews. No amount of proof sufficed – not until the postfactum silent evidence of the tortured remains could be viewed. The Free World’s theme in our generation too is the same punctilious and pedantic insistence on unassailable proof. And somehow, no amount of proof ever constitutes sufficient corroboration. Thus US President Barack Obama grudgingly mouthed something about the promise to regard any use of chemical weapons in Syria’s civil war as a “game-changer.” In the same breath, though, he cautioned that intelligence assessments about the deployment of such weapons were still preliminary. Artfully, Obama seemed to be talking tough while at the same time appealing for patience and fending off pressure for some tangible response. It was an object lesson on how to speak a lot and say nothing. “Horrific as it is when mortars are being fired on civilians and people are being indiscriminately killed, to use potential weapons of mass destruction on civilian populations crosses another line with respect to international norms and international law,” Obama told White House reporters. The latest strikes attributed to Israel near Syria’s capital came in response to different red-lines in a different subplot. At this point we can only subjectively speculate on whether this action eases Obama’s discomfiture or intensifies it. To be sure, Obama’s shilly-shallying in itself marks quite a shift from his previous official stance. Israel’s earlier disclosure that sarin gas was used in Syria, was a source of perceptible annoyance in Washington, where the distinct preference was to keep the inconvenient truth under wraps. Hence progress was discernible in the very admission that America’s intelligence community believed with “varying degrees of confidence” that the chemical nerve agent was used by Assad. Of course Obama isn’t the only statesman who has perfected the art of spouting evasive verbiage even when seemingly putting an end to evasion. To cut the run-on rigmarole short, Assad may have a lot to lose sleep over but it’s not about intervention from Messrs. Obama, Cameron et al. They’ll continue talking the talk but they don’t really want to walk the walk. Ostensibly it’s because of the Bush Administration’s alacrity to invade Iraq in 2003 on the pretext of WMD stockpiling by Saddam Hussein. Since no such arsenals were found, extra circumspection is now mandated to ascertain the use of forbidden chemicals by Assad. A decade ago George Bush latched on to any excuse to remove Saddam even without conclusive substantiation. Today firm evidence exists against Assad but Obama will latch onto any excuse to avoid removing Assad. That said, for once, Obama hasn’t got it all wrong. Ruthless as Assad is, his downfall would turn Syria and adjacent lands into uncontrollable battlegrounds between his warring would-be successors – all of them the most nefarious of Islamic fanatics, be they Iranian proxies or al-Qaida surrogates. The lot of hapless noncombatants would hardly be improved. Politically incorrect as it is to say so, the mutual attrition now of pro- and anti-Assad combatants probably benefits America, Britain, Israel and the entire Free World. It’s the same as the mutual bloodletting between Iran and Iraq was in the 1980s. Anything else is a choice between the devil we know and a whole host of even more dreadful demons who aspire to replace him. This is where the West’s hypocritical affectation gets in the way. The obsessive humanitarian posturing and fixated pretense of scrutinizing hypothetical red lines can in themselves bring on nothing less than colossal calamity. Why? Because Assad isn’t the region’s lone villain. Other bad-guys are keeping close tabs on the international reaction to Assad’s excesses. The more sanctimonious the pronouncements from abroad, the greater the expectation that that they’d prompt punitive action. When nothing of the sort materializes, however, an unambiguous message is sent to Tehran’s ayatollahs. They can rest assured that no American military option exists against their nuke production. In other words, talking the talk is downright dangerous. The greater the anti-Assad verbal offensive, the more it underscores the absence of a military offensive. Intently vigilant, the Iranians can doubtless be impressed with US inertia. The only constructive course of action for Obama is to tone down his insincere anti-Assad rhetoric and to quit sounding the identical refrain for both Syria and Iran. The same goes for smug EU pontificators. The scarcity of even nominal semantic differentiation between the dissimilar Tehran and Damascus dangers should ring the loudest alarm bells for all Israelis. The bleak signal to us is that the Iranian threat to “wipe the Zionist entity off the map” will be treated as indolently and as dishonestly as the internecine Syrian slaughter is. There will be the same pompous oratory accompanied by the same search for yet more irrefutable verification. The smoking gun for Iranian duplicity will never be found, unless – heaven forefend – in the fallout of an atomic mushroom. Indisputably, no national collective can afford the lackadaisical lunacy of waiting till after its own death. Definitive proof supplied by our demise would be of little use to us posthumously. The unavoidable bottom line for a sovereign state can only be self-reliance. No one else will come to our aid, not when it still matters. Such persistent Jewish squawks about Iran’s deadly designs for Jews, and the Brotherhood’s deadly designs for Jews, and Fatah’s and Hamas’s and Hezbollah’s deadly designs for Jews — the list is long — are no less of a public nuisance and upsetting to the tender sensibilities of a good many, maybe even a majority of Jews in America, who are dupes or in utter denial. Of course, there are no historical precedents for the Jews concerns about new genocidal attempts by the groups that you`ve cited, as, the Romans didn`t subjugate Israel in the 1st century CE, then, suppress a major revolt in the 2nd century CE, murdering a large percentage of the Jewish population both times, the Muslim hordes of Arabia didn`t slaughter a large number of Jews during the expansionist periods in the 7th to 10th centuries CE, the Inquisition, in its many areas of operation from the 14th to the 19th centuries CE, killed no large number of Jews, the Crusaders, on their way to and from the Holy Land didn`t slaughter any Jews, various European noblemen and royals didn`t kill large number of Jews during the 13th to the 19th centuries, there were no pogroms in eastern Europe in the 17th to early 20th centuries, and, in the Holy Land in the 29th century and, to top it off, the Holocaust clearly is a fabrication, as, there is no evidence that the Nazis (and their allies) murdered at least 6 million Jews during their reign of terror. So, why should the Jewish people in Israel (and abroad) have any concerns that the groups that you cite, who wear the mantle of the Nazis and historical Jew killers, said groups having continuously expressed their goals of ridding the planet of Israel and all Jews? Must be pure paranoia! Pure and simple, of course! What the hell else could it be . . . ? Yes Sarah, the mutual attrition of pro- and anti-Assad forces in Syria is a big gain for the whole of the West and Irans main ally gets weaker by the day ! Israels attack on Mount Qassioun just demonstrated the IMPOTENCE of Mr. Assad. Of course will Obama NEVER attack Syria or Iran, he is a talkinghead, as he so convincingly demonstrated in Benghazi ! Most of Saddam Hussein’s WMD were moved to Syria by a Russian clean-up crew, Spetznaz special forces in civilian clothes. Some were removed by air (under cover of humanitarian flights) and some were removed by a ground convoy. The convoy was spotted but Bush Jr. declined to act (because his self-imposed deadline had not occurred yet). The WMD were moved to Bekka in Lebanon. Think about Iraq for a minute and consider this analogy. Suppose that the police know a warehouse is being used to store stolen goods. The police send written notices to the owner of the warehouse, and finally set a deadline announcing when a search warrant will be executed. Would you realistically expect the loot to still be there, when police arrive at the exact time they announced months in advance? The Israeli ambassador to the US was recently on Fox News, interviewed by Chris Wallace. He claimed that international law prevented the destruction of chemical WMD by air because of collateral damage. However insurgency expert and co-founder of the CIA’s counter-terrorism center, Bruce Tefft, said in response to my question that napalm would deactivate the chemicals and minimize collateral damage. The west should consider providing assistance to whichever side is in danger of losing. But the type of assistance should be limited and not include advanced technology. Just for the record, there WERE WMD’s in Iraq. These were chemical and biological WMD’s, that were found in a bunker, beneath the Euphrates River, as U.S. troops marched into Baghdad, in April 2003; says Kenneth Timmerman, in his 2005 book, “The Shadow Warriors.” And Cameron isn’t a real conservative; don’t know what he is, but he’s not a true conservative. But thank you for this needed-to-be-said article; there are those in the U.S. who don’t regard Israel as a pest.